Fear of Color? 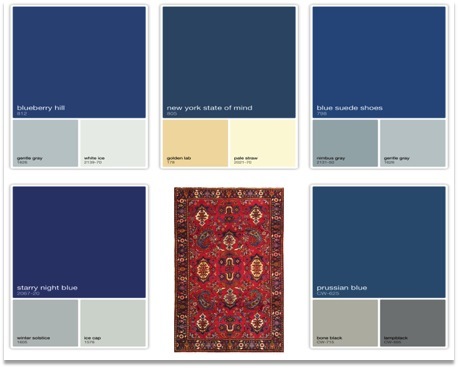 Find Your Style With This Easy Color Guide! 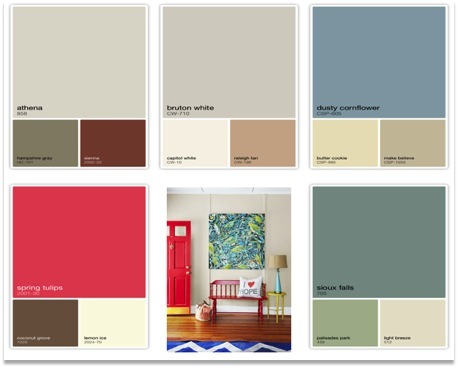 One of the trickiest aspects of a DIY design makeover is COLOR. Many people really fret over this one — and for good reason! They ask themselves, “Will it be what I like? Will it go with everything? Will it match? Does it have to match? What if I get one piece of furniture here and another one there – how will I know if it will look good?” If you have had any of these thoughts rattling in your brain you are not alone! 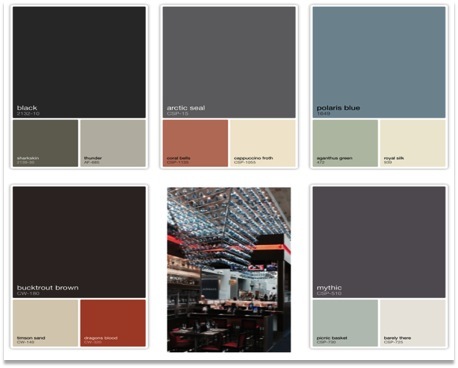 Color Analysis, not Color Paralysis! 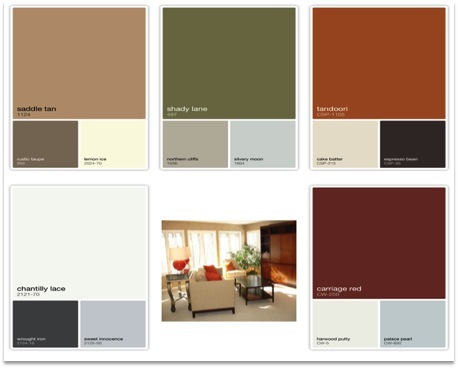 With this color guide, you will be able to find different style categories, and with that find one that is your favorite or pretty close to it. Check out the style categories below to find your favorite style! Each style category offers you a color guide with 5 main color combinations. Pick your style category. This style embraces clean lines and whimsy using hard surfaces and neutral colors. So if you like simplicity, clean lines, not a lot of fuss, this is a good choice for you. The browns could be in the texture of leather, herringbone, paired with the camels and flinty grays and blues as the background. This style embraces clean lines and whimsy using hard surfaces and neutral colors. So if you like simplicity, clean lines, not a lot of fuss, this is a good choice for you. 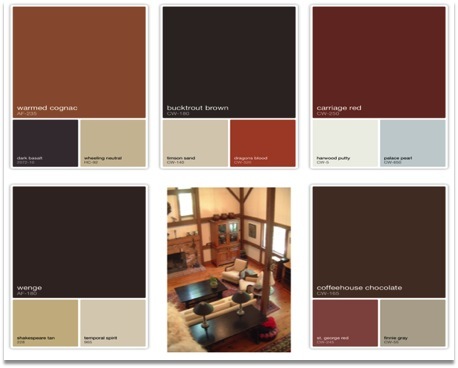 Another color combination in this style category is the rich tandoori and carriage red colors, which are a good contrast to some of the lighter neutrals. This style embraces minimal embellishment in cool glassy materials using reflection for a splash of glamor punctuated with small hits of bright colors on a neutral canvas. It’s a bit high style and dramatic and if that is the look you are seeking this is another color interpretation of this style category. This style embraces minimal embellishment in cool glassy materials using reflection for a splash of glamor punctuated with small hits of bright colors on a neutral canvas. This style is similar to shabby chic, retro, or country cottage, and uses comfortable furnishings, cheerful easygoing colors and bright patterns. Here is one color combination for this popular style category. This style is similar to shabby chic, retro, or country cottage, and uses comfortable furnishings, cheerful easygoing colors and bright patterns. 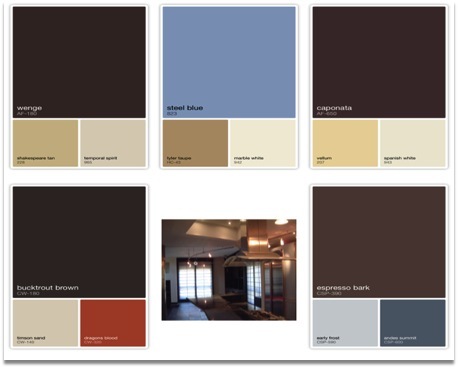 Here is another color combination for this popular style category using a dark wall. This style embraces clean lines contrasted with earthy antiques, unique travel collections. Intricate tribal rug patterns embrace activity through traditional colors on a canvas of neutral colors. This style embraces clean lines contrasted with earthy antiques, unique travel collections. Intricate tribal rug patterns embrace activity through traditional colors on a canvas of neutral colors. These are classic blue and tan color combinations that will work just about anywhere. You Are Now On Your Way! 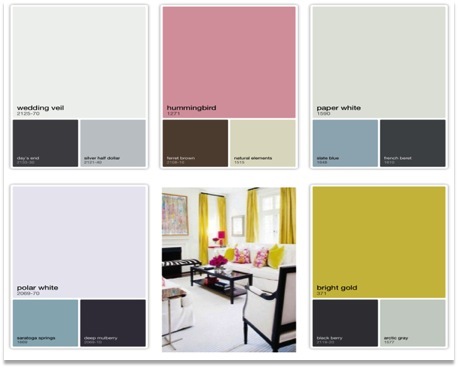 You can use any of these style categories or colors to get you over your fear of color! Terrific–you can get started now! First though, a little conversation, ok? 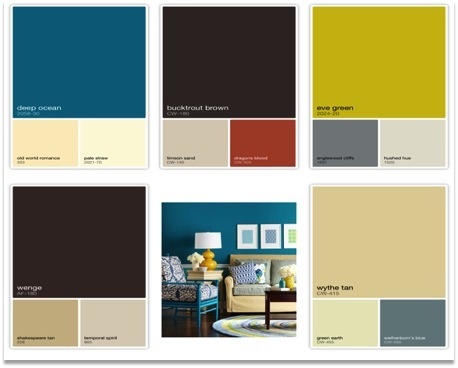 Which of these color combinations speak to you? Which style is your favorite? What has worked for you? Is there one you will be using right away? Leave a comment below and join in… let me know. Is it standing room only at breakfast? It may be time to re-think your kitchen layout. A breakfast nook doesn’t have to take up your entire kitchen, is great for everyday use and might be just the thing you need for extra seating over the holidays. A corner breakfast nook in a natural wood finish provides wraparound bench seating and the extra bench can be moved to the dining room if needed. If space is limited, try a versatile counter and stool dining set. The counter height table is no wider than a console table and the stools can nest underneath when not in use. A three piece set can do double duty as a breakfast nook or bar set. And don’t rule out stools for comfortable extra seating at your kitchen counter. Now, let’s look at your dining room. When it comes to holiday sit-down dinners, does your ping pong table get a whole new reason for living? Today’s dining sets accommodate any sized space and come in designs that match your lifestyle and coordinate with the rest of your home’s décor. 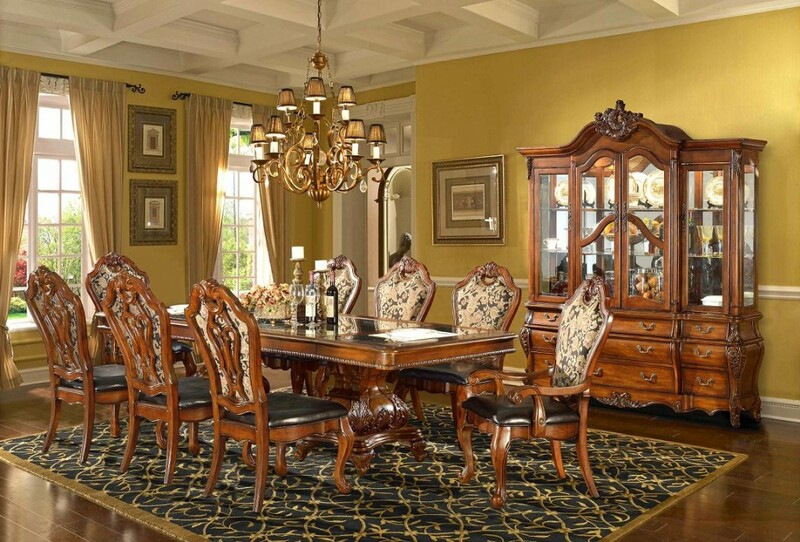 Large families who prefer classic formal dining can look to an expandable rectangular pedestal table dining set. Choose a table that has one or two expansion leaves so you can easily seat from 8 to 12 people comfortably. Small families or those who prefer intimate casual dining have plenty of options, too! For a trendy loft, a contemporary round table dining set makes a definite statement while defining your dining spaces. 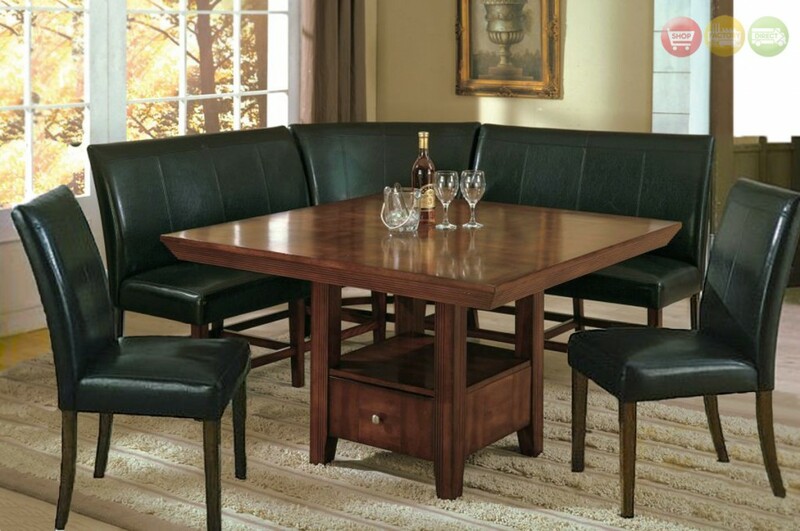 Or choose a square counter height dining set for a small separate dining room. As you think back to past holiday seasons, do you wish everyone could have gathered more comfortably? If you’ve never owned a sectional sofa, maybe it’s time for another look. Not only are sectional sofas more popular than ever, there’s no doubt that they maximize seating space. Sectional sofas come in many fabrics and styles. For a streamlined Euro-contemporary look, you can’t beat the plush look of black or white leather. Try a U-shaped sectional with built in lighting and side tables and when the gang’s gone home you can lounge on the chaise side with your favorite novel. For those who love a U-shaped configuration with a chaise, but prefer something more traditional, a fabric sectional sofa with rolled arms and a skirted bottom offers cozy seating. What if you love to recline in casual comfort? 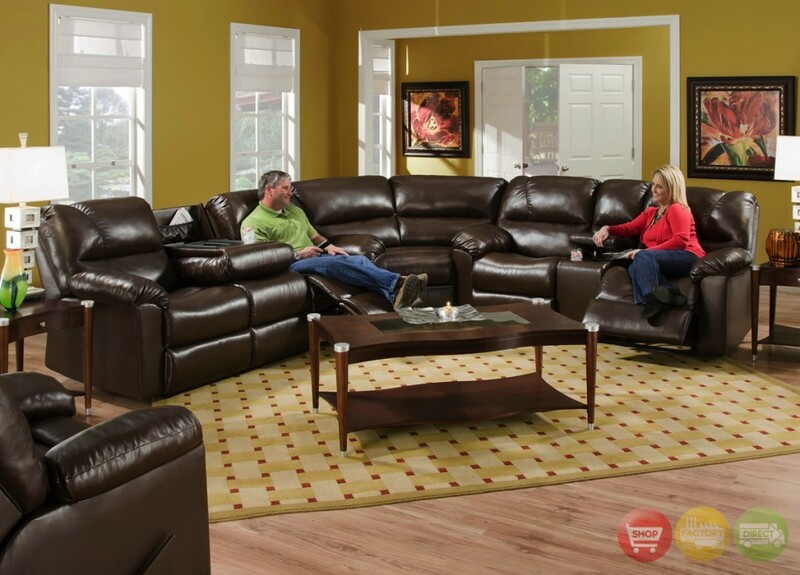 Motorized reclining sectional sofas are ready and set to go for a relaxing game or movie night. In fact, you can “go all out” for this year’s holiday feast knowing that your new sectional sofa will be on hand for everyone to relax in. Pour some of your own personal touches into the mix and you’ve got a tried and true recipe for creating an inviting home for the holidays.